These days, you have to be quick off the mark if you want to get the accommodation you want at MJRoc dance weekenders. Most of our requests come from females wanting to book a place in our Female Rooms. Others come when we have sold out on options. MJRoc weekenders can sell out very quickly (all our events have sold out for last seven years), but things do happen where people have to cancel or move lodges etc, so we run a Reserve List to see if we can give people what they want. 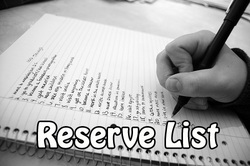 So, if you want to put yourself on our Reserve list, then please complete the form below and we'll get back to you asap. We will keep you up to date with monthly news letters. If you register but later change your mind, please let us know and we shall release your details.